Here we are again on the Moscow Metro Tour, getting off at the next stop after our glance around Kievskaya Metro station. Park Kultury, like Kievskaya, is a station with multiple lines connected, hosting stations for both the circle and the red, Sokolnicheskaya line (which shares the name with a park north of Moscow and was the first line in Moscow). Incidentally, this red line is awesome for getting to Sparrow hills, a stop that’s on a bridge (yeah, super cool), which has glass walls (omg! even more cool), and usually has a foggy view of the Moscow river, Luzhniki stadium and Gorky park (ok, a bit of a let-down on a grey day). But, if you walk up the hill you can get the best view across Moscow. More on that another time. 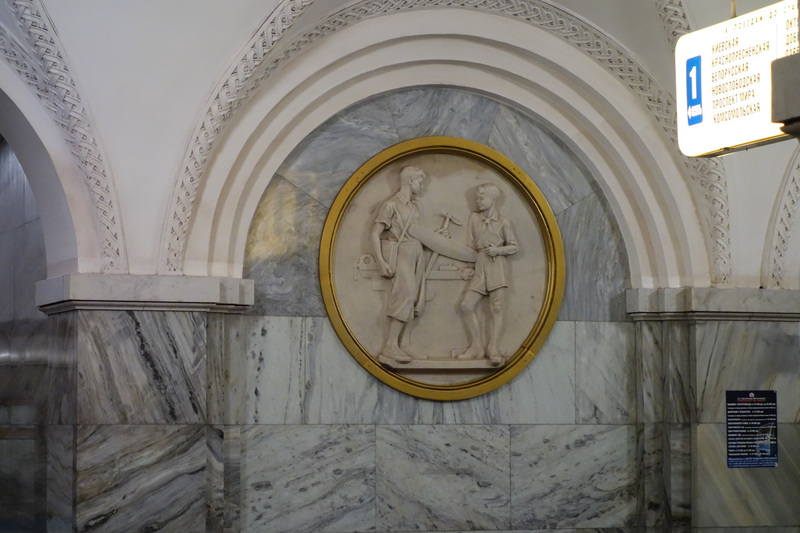 Park Kultury again features quite a bit of marble, and incidentally, was one of my Mother’s ‘most memorable’ stations. On the columns are circles of large white marble, chiselled into different figures depicting dancers, sportsmen and musicians in action. The floor, in contrast is tiled in the pattern of carpets, and the second platform provides a Greek-inspired row of marble columns. Historically and architecturally, Park Kultury is one of the more interesting metro stations. Situated on the banks on the river, construction of the underground station that is under groundwater level proved incredibly difficult. Construction started in 1933, and proceeded mostly overnight for eleven months. The second platform and line was connected in the 1950s. In order to keep the station from flooding, careful barriers had to be constructed before the pit was dug for the station, and the engineers had to lower the water level to avoid the flooding of the pit. In addition, a wooden bridge was designed and built to allow cars to continue their traffic above ground as usual. Take a final look around. Ready to go? Cool, then let’s keep going on the circle line- next stops, Oktyabrskaya and Dobryninskaya .